Upgrade your LS2, LS3 or LS7 powered Corvette with Magnuson’s TVS2300 Supercharger Kit and unlock your C6's full potential. These kits are designed to deliver maximum performance while retaining street drivability and reliability. A C6 equipped with a Magnuson Hybrid Roots Style Supercharger produces approximately 120 horsepower and 120 foot-pounds of torque at the rear wheels more than stock at only 6 psi. Remember, peak horsepower and torque numbers cannot reveal the true power curve. "Under the curve" power is significantly enhanced delivering near instantaneous boost and torque upon demand that really pins you back in your seat. Inside of the magnuson supercharger manifold, a large liquid-to-air intercooler keeps your Intake Air Temperatures in check and provides consistent and repeatable performance. Combine that with the front-mounted heat exchanger, electric water pump, and intercooler coolant reservoir and you have a supercharger system that has IATs that are typically only 20-40 degrees (Fahrenheit) over the ambient temperature. Maximizing your efficiency during cruising is the job of the supercharger’s integrated bypass valve. This vacuum operated system allows air to bypass the supercharger and the rotors to “free-spin" under light engine loads. During this situation the parasitic loss of the supercharger system is essentially negated taking less than one-third of a horsepower to turn the rotors. This bypass valve also allows your supercharged Corvette to maintain stock-like drivability and fuel economy - giving you a package that delivers power without compromise. 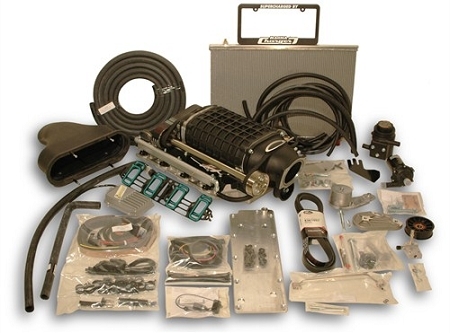 Down to the smallest part, our MagnaCharger line of bolt-on supercharger systems are engineered as a complete package. The supercharger, supercharger intake manifold, inlet, pulley, fuel injectors, fuel rails, front & rear fuel crossovers, and intercooler come pre-assembled to make installation simple and easy while the accessory box is organized into individual sub-assemblies to help ensure that you don’t lose track of parts in the middle of your install. All of the hardware needed for a full and complete install is also included so you won’t be running to the parts store in the middle of your installation. In addition, our full color, step-by-step Installation Manuals will walk you through the install process with exacting attention to detail. Pricing options include either the Magnacharger factory tuning or our Black Bear Performance custom tuning. Please contact us to inquire about any specials!